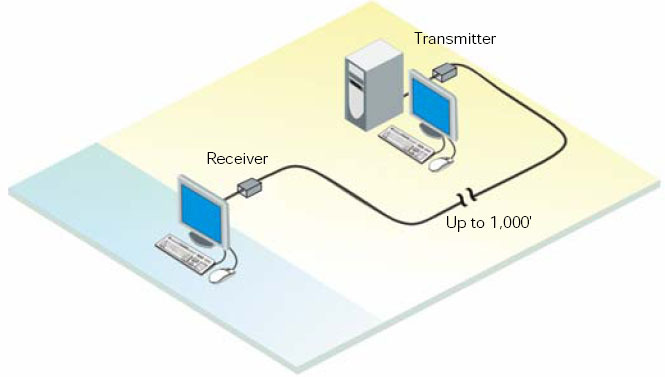 The ViewLink CATX KVM extender (VLK-TMVURAVU-W) is the extender of choice for businesses big and small that must control a computer from an extended distance. The Rose ViewLink CATX KVM extender (VLK-TMVURAVU-W) is a single access USB, VGA KVM extender kit, auto EQ with automatic video skew adjustment option. The ViewLink CATX (VLK-TMVURAVU-W) allows you to position a computer up to 1,000 feet away from the KVM station using common twisted pair CATx cable. Use any length of data cable up to 1,000 feet, Rose ViewLink will calculate the cable length automatically, set the gain and equalization, and adjust the video skew to provide a crystal clear image. No jumpers to set or knobs to adjust. Access to your computers is made convenient in a variety of situations. You can locate users away from hazardous industrial environments; locate computers away from areas vulnerable to theft of hardware and data, reduce noise and heat, and increase desk and floor space. Question: Hi. One of our customers is asking for 1 pcs VLK-TMVURAVU-W. Is this available by any distributors in Norway? Answer: Thank you for your inquiry. To locate a local distributor, please contact Rose Electronics directly through Rose's contact page: http://www.rose.com/html/contact.html.